As we mentioned in our article, Top 10 Crankbait Design Elements For Tackle Makers, the crankbait has many characteristics that allow fisherman to use them in a wide variety of applications. 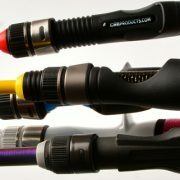 One of the more common questions we run into is why do fisherman need specific rods for specific types of fishing. So let’s talk about it. Why Do I Need A Specific Crankbait Rod? In a word, performance. A good analogy you may have heard is to compare your fishing rod to a golf club. When you play golf, every shot requires a different club. Pick one with not enough loft, and you may send the ball over the green. Use too much loft and you may not even reach the green. It is conceptually the same with a fishing rod. If your rod has too much action, you may rip the crankbait out of the fish’s mouth. If your rod does not have enough power, you may not be able to pull that hog out of the cover. For most crankbait fisherman, a rod that is crafted with a moderate taper will work fine. What this means, in general, is that the lower part of the rod has some muscle, while the top part of the rod has some play. Here is a breakdown of the key considerations when selecting a crankbait rod. 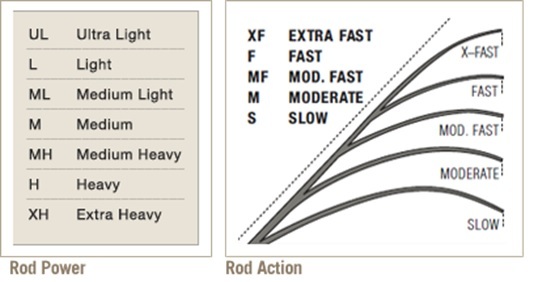 It really comes down to weighing the pros and cons of each attribute before deciding on your rod. Typically, crankbait rods range from 6′ 6″ to 8′ in length. Which length is best? It really depends on your needs. Rods are basically a lever, so the longer the fishing rod is, the more line it will pull when setting the hook. Since this creates more leverage, you should increase (in theory) your strike-to-catch ratio. 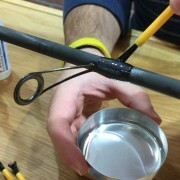 Longer rods generate more power when casting, resulting in longer casts. This is great for crankbaits since it allows you better control over depth, as well as longer lure time at the desired depth to tempt a fish. However, that does not necessarily mean you need an 8 foot rod. Shorter rods have better casting accuracy, and it is easier to fight a fish in tight quarters like overhanging brush. 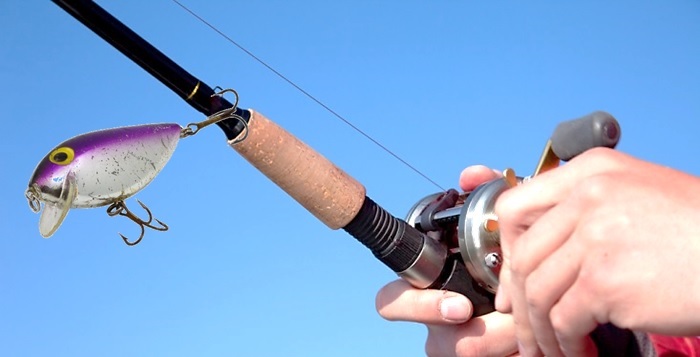 Traveling with a shorter rod is also easier, so think about the tradeoffs before deciding. Line size can vary greatly, often between 6 and 30 pound test. Lighter line will cast farther, and the crankbait will run deeper. However, heavier line will be more forgiving around structure, and provide more fighting power. Crankbaits now exceed 2 ounces, so there is a ton of choices. It boils down to what kind of crankbait fishing do you do? If you fish crankbaits deep, the crankbait will most likely increase in weight the deeper it is rated to travel. If you fish shallow running crankbaits, it is likely that your lure will be lighter. Exceptions abound of course, so look at the crankbaits you use the most, and use the heaviest one as your weight requirement for your rod. For crankabits, you really can’t go wrong selecting a rod that has a moderate-to-fast action. Some experienced fisherman may have counter opinions, and there certainly may be specific examples where a different action if preferable. 1. A medium (moderate) action rod offers the slight give you need to fight a fish with a mouth full of treble hooks, so the fish is less likely to throw the lure. 2. The softer action absorbs sudden increased tension in the line, like when the fish darts into cover or under the boat. Like a shock absorber, it still maintains a steady controlled line tension, but reduces the chance of line tightening too fast which can increase or loosen the hook set holes in the fish’s mouth, which may allow the fish to come off. 3. 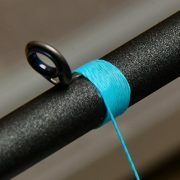 A mid-range action rod (especially when paired with the proper guides) will translate into longer casts. This means your lure gets out there far enough to give your crankbait the time and distance it needs to reach its maximum depth on retrieve. 4. A slower action rod automatically provides a slight delay in the hook set, which decreases your chances of ripping the hooks out of the fish’s mouth. We have all been there, right? We say to ourselves, “wait until you feel the fish” or “one-miss-iss-ippi” – but when we feel that tug, we can’t help it and jerk that rod too hard/fast. So it basically has a “calm down” mode built into the action. 5. That slight delay also helps you fish crankbaits around cover with a more forgiving action. One effective way to fish crankbaits is to run them into structure, like a submerged log. With a stiffer action rod, the lure is driven into the log with more direct force, while a softer action will allow you time to feel the log thump so you can stop your retrieve for a second and then continue to reel in again. This doesn’t mean the rod makes the crankbait weedless, it simply means you have a delay to work with to prevent some hang ups. There are 3 general power ratings that work best for crankbaits; Medium-Light, Medium, or Medium-Heavy. Which one you may need is heavily dictated by the requirements you have for line size and lure weight. Each rod model will list the line size and lure weight it is rated for. Keep in mind those are limits, and not casual recommendations. Choosing a rod with the proper power rating for the crankbaits and line you will be fishing with not only assures accuracy and performance, but reduces the possibility of rod damage. Therefore, if your requirements are bordering between two specs, you may want to choose the heavier of the two choices. 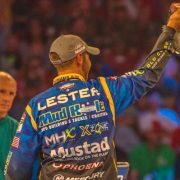 Just a quick note that crankbaits and the requirements discussed in this article apply to both freshwater and saltwater. Many “freshwater” rod blanks are perfectly suited, and often used, as saltwater rods. Sometimes the crankbait requirements are so specific that the fishing rod needs to be made with one particular fishing lure in mind. 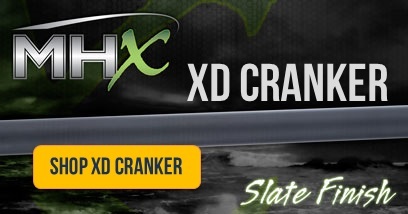 Such was the case when MHX designed their XD Cranker rod blank. The MHX XD Cranker Rod Blank was specifically designed to handle the unique requirements of Strike King’s XD Diver crankbaits. Strike King made the XD with one thing in mind; to dive deep. They dive deeper than just about any crankbait – over 25 feet! Because of their heavy body and unique design, they cast farther, wiggle tighter, and have the ability to run as deep as the fish are. 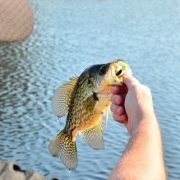 A lure of this size, weight, and huge bill, really pushes water out of the way in a hurry, causing an average rod to have difficulty fishing the lure. 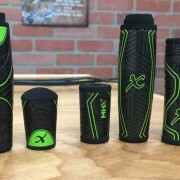 MHX designed their XD Cranker rod with an extra-heavy power rating in the lower part of the rod, while still keeping the Moderate-to-Fast upper action. The result? Lure Weight: 3/4 – 2 1/2 oz. Crankbait fisherman can now sling a lure like the XD Diver with accuracy, have all the sensitivity needed for the strike-to-hook-set, and still be able to land the fish no matter where the fish tries to run. Mud Hole, by far, carries the widest selection of crankbait fishing rod blanks on the market. Specifically, the MHX series rod blanks have the widest crankbait rod choices available. What makes the MHX series rod blanks so great is that they incorporate innovative designs of both traditional and progressive actions. The multi modulus materials they use allow them to utilize the correct material in each portion of the blank. When you combine that with their advanced production process, that is second to none, it’s no wonder MHX is creating rod blanks that are unparalleled in today’s market place. In fact, the MHX series are as much as 40% lighter than comparable standard graphite models, and incredibly more sensitive. Lure weights Supported: Over 2 Oz. Credits: Rod Power vs. Action image from our friends and partners at St. Croix.